Anyone else discovered this magazine yet? 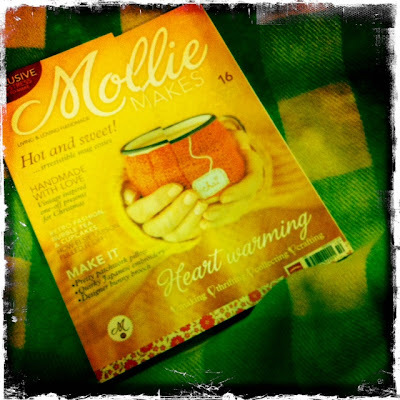 Mollie Makes is a UK mag and I recently spotted it in my local bookstore. Not a scrappy mag but a crafty one ... but lots of inspiration, colours and design which inspire all things crafty. Actually I spotted it on Ali Edwards blog ... looked up their website and was contemplating buying an online copy because it looked like a mag I would enjoy ... then the next day guess what I spied in the bookstore ... was a very happy camper indeed! I think they publish 13 times a year, and this is only issue 7 so it hasn't been around for long. So if you are looking for a new read, something that covers all the crafty bases, something new to spark that creative mojo, then head to your bookstore and check out if they stock it! Sure do, I have issues two onwards....the only thing that bugs me about the mag is that it takes so long to get to NZ so we are a few issues behind. I have been getting hard copies of this from a cool mag shop and they call me when it is in. I am considering buying it online as it will be better reading it as it comes out. I have done that with Ideal Home which is funny cos the Dec issue of that is out now in the shops but I have already read Dec, Jan and Feb already online.